Toys ‘R’ Us has hired advisers specializing in restructuring at a law firm as it attempts to handle debt that has reached millions of dollars, that is coming due, said a pair of sources who know the situation. Amongst options the retailer, whose owners are private equity companies, is considering includes bankruptcy, said the sources. The toy company needs to see best way to pay debt of approximately $400 million as it keeps trying to increase its sales, especially during the soon to arrive holiday shopping season. The toy retailer, which is based in New Jersey, maintains hope that it will find a way to refinance its debt. However, hiring restructuring lawyers by a company that is financially troubled usually is a signal that bankruptcy could be a real possibility. Toy ‘R’ Us currently is evaluating a number of different alternatives to address the debt maturities it has in 2018, which could include obtaining more financing, said a spokesperson for the toy company in a prepared statement Wednesday afternoon. The company was acquired by Bain Capital and Kohlberg Kravis Roberts two private equity companies, as well as Vornado Realty Trust, a real estate company, in 2005 for the price of $6 billion. For years, Toy ‘R’ Us dominated the sale of toys and its Babies ‘R’ Us stores were the leader in the sale of baby products such as strollers and diapers. However, competition has been intense from the big box retailers such as Target and Walmart that have increased the number of toy offerings they have online and in stores. The rapid sales growth of toys on e-commerce giant Amazon has cut into the Toy ‘R’ Us market share as well. In 2015, the flagship store of Toys ‘R’ Us in Times Square was closed to save money as the rent was so high, but last month, it opened a seasonal store that is much smaller just a couple of blocks away in anticipation of the holiday shopping season in the Big Apple. Many of the traditional retailers continue to struggle against competitors like Amazon, but the debt load that Toys ‘R’ Us is carrying has increased the pressure. 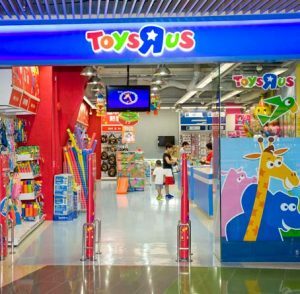 The toy retailer has nearly $5 billion worth of long-term debt, while at the same time has burned through large sums of cash as its sales continue to decline. At the end of April, the company was holding $301 million in cash, which was down from the same period one year before of $458 million.